Many people ask, “what is salvation?” In the Bible, we see that salvation is the deliverance from danger or the penalty of sin. Are your sins forgiven? Do you know the gospel (good news) that saves? If you don’t know the gospel and you can’t explain how to be saved, you need to examine yourself. You may ask, am I truly saved? Most of us trust the Lord when we are in danger, but do we trust the Lord for the forgiveness of sins? Are we confident that our sins have been paid for by another so that we do not have to pay the penalty for them ourselves? In this article, I am giving a full presentation of the good news starting with defining the problem and continuing through to the solution. May God open your heart and illuminate your mind to the glory of this gospel. First, let’s examine the problem. Hell is real! There is a Christian cliché that states that God hates the sin and loves the sinner. While this statement does possess a modicum of truth, it is also misleading. God both loves and hates individuals themselves, not merely their disembodied actions. You may respond, “I don’t believe that.” It really doesn’t matter what you believe. What matters is whether or not it is true. What does the Bible declare? Psalms 5:5; 11:5; 7:11; and Proverbs 6:16-19 teach that God does indeed hate and that He is angry with the wicked. It is not the disembodied sin that is going to be thrown into Hell, it is the sinner themselves. There will be weeping and gnashing of teeth. We have broken all the commandments of God. We have thoughts that are so wicked that we wouldn’t want to share them even with our closest friends. We know those things that are deep in our hearts. We have thought evil thoughts even against our own family members. We have done wicked things before a holy and just God. Our hearts are evil and our minds are evil. We often speak of outward sins, but consider the inward sins about which only you and God are aware. Romans 7:18 teaches us that there is nothing good that dwells in us. Ephesians 2:1-3 teaches us that men are dead in sin and by nature a child of wrath thus a wicked person never would or could choose God. Mark 7:21-23 teaches that all evil proceeds from the heart. Genesis 6:5 teaches that every intent of the thoughts of man’s heart is only evil continually. Romans 6:14-20 teaches that man is a slave to sin. Ephesians 2:15 unbelievers are at enmity with God. Romans 1 says unbelievers are haters of God. We would rather choose our “best life now” over God. Man is radically depraved. Man hates God. Therefore, God is just, holy and loving in sending the evil man to Hell. A good judge must punish criminals. If he lets them go free the judge is a criminal himself. If a criminal says, “look at all the good things I have done,” that would be bribing the judge which only compounds the offense. Our crimes are before the judge and the world. How can God acquit the wicked without becoming an abomination Himself? He is the good judge and we have sinned. We’ve lied, stolen, envied, blasphemed God’s name, murdered in our hearts, committed adultery in our hearts, etc. God must sentence and punish us. God says to do all things for His glory. Do we walk for His glory? Do we talk for His glory? Do we breathe for His glory? Every single thing in our lives, do we do it for His glory? God is worthy of our entire selves. It’s all about Him, but we have lived our lives as though it is all about ourselves. God says to love Him with all our heart, soul, mind, and strength. Never in my life have I ever loved God with everything in me. Never. That is sin. Yet God demands perfection. Compared to the way God gave, we know nothing of what that means. The Father gave the Son everything. God points at the stars and they appear in their place and obey. God points at the oceans and they obey. All creation submits to the will of God. Even rocks cry out to praise His name (Luke 19:40)! But then God points to us and we cross our arms and say “no”. We declare “It’s my life.” We thus deserve the full extent of God’s justice and wrath. His standard is perfection. The solution to the problem. God came down! You can clearly see that God would be just in exiling us from His presence for eternity. The Father looked at the Son and the Son looked at the Father. The Son said “I know what needs to be done.” Our Lord took off His Heavenly robe and He came down. The God-Man Christ Jesus. Let’s take a second to attempt to understand the Trinity. There is one God in three divine persons. The Father, Son, and the Holy Spirit are all in one. Jesus is not created. The three persons were involved in Creation. Jesus is God in the flesh. God had to satisfy the requirements of justice. Because of our sinfulness, we are unable to do this for ourselves. We are disqualified. Since His justice has to be satisfied, only a sinless God could pay the fine. He was the ultimate sacrifice. Either we bear the penalty for our sins ourselves resulting in eternal separation from God or God bears our sin in our place as a substitute. God loves us so much that He died for us, just so He can see us live with Him for all eternity! No one can meet the requirements of God except God Himself. Jesus is God. He had to be man to live the perfect life that man couldn’t live out himself. Jesus lived a perfect life for 33 years. Something you and I could not do for 33 seconds! The lavishness of God’s grace! How can we know God’s grace (unmerited favor) without understanding our utter sinfulness, His justice, His holiness, and hatred toward sin? We deserve nothing and John 15:5 teaches that we can do nothing apart from Christ. Our every breath comes from Jesus Christ. We often hear “the Jews killed Jesus.” or “Christ killers”. No! We killed Jesus. He died for our sins. Jesus was nailed to the tree for us. Jesus looked at us while we were in sin and said, “Father, forgive them, for they know not what they do.” He paid the price for us as our substitute. I once heard someone say, “it’s something that He has seen in me.” What? He sees nothing good in you! Don’t you realize that the Bible says that unbelievers are haters of God, at enmity with God, dead to sin and slaves to sin, blinded by Satan? Nothing good comes from within you. No one seeks or desires God. The heart and the mind are evil. Apart from Him we can do nothing. Through Christ a dead man will live. That is grace. When we understand how far we were from the holy God of the universe then we can truly understand the phrase, “God is love!” God loves us. His grace is more powerful than all our sins. There is no chain that is so strong that it cannot be broken by the blood of Christ. On the cross He took away our shame. You may have thought to yourself that you have gone too far, God is disappointed in you, God is mad at you, God is punishing you. No. He gave His life for you. You can be free. Sometimes it is difficult to believe God’s great love for us in the light of our sin. His grace is enough! Take a moment to realize how much Jesus loves us. Don’t neglect the gospel message which we read about below. The Gospel message of salvation. Jesus died. The God-Man died. Those present thought hope was finished and lost. The Savior died. But, just as Psalm 30:5 says, “weeping may tarry for the night, but joy comes in the morning.” The God-Man lives. Only God can resurrect Himself. He lives again. He rose from the grave defeating sin and death. There is so much glory in the gospel. He is the risen Savior. The gospel is that Jesus died, He was buried, and He was resurrected for our sins. Ask Christ to forgive your sins. Trust Christ for the forgiveness of sins. Believe Christ has taken away your sins! The Christian says, “all my sins are gone.” The Christian says, “I’m forgiven.” Rely upon the perfect merit of Jesus Christ. Most all of us know what Jesus did. Even the demons know. It’s one thing to know but it is another thing to truly rely upon the blood of Jesus Christ on your behalf. Stop striving. Stop trying to gain your salvation by your own merit. Stop struggling to be right with God by your own good works. We will never be good enough. Surrender and fall upon and trust in the perfect merit of Christ. I’m so sinful. All I have is the blood of Christ and if Christ didn’t die for me then I have no hope. Only to the cross I cling. My hope lies in Christ alone. Jesus is my only claim. Jesus is the only way to Heaven. Repent (a change of mind that leads to a change of action) and believe the gospel, the good news, and you shall be saved. All your sins have been nailed to the cross. When you rely upon the perfect merit of Christ alone you can stand before the Lord with confidence knowing that you are right with God. You know that all your sins are paid for. Charles Spurgeon said, “to believe is to trust, or lean upon Christ Jesus; in other words, to give up self-reliance, and to rely upon the Lord Jesus.” Don’t ask Jesus into your heart. This is not biblical. This type of thinking can lead you to doubt if He came in or not at a later time. Trust in what He did for you. Rely upon Christ. Turn to Christ and live. We must never forget the doctrine of regeneration. Jesus says to repent. Repentance is a change of mind that leads to a change of action. It leads to bearing fruit and turning away from sin, a hated for sin and a love for the things that God loves. Repentance is not a work that we do unto salvation. Repentance is a work of God. God grants us repentance. Salvation is a supernatural work of God where God supernaturally changes a man. God makes a dead man live. God gets all the glory. When you put your trust in Jesus Christ alone you will be a new creation. God draws us to repentance, God saves us, God makes us new. God changes us. God gave us the right to become His children. God made us saints. God works in us to conform us into the image of Christ. We are no longer slaves to sin. We are righteous in Christ. We can begin to know and enjoy the Lord because of Christ. Christians cannot tolerate sin anymore. Sin is hurtful to us and we come to hate it. Believers have a new relationship with sin. We don’t obey because obedience saves us. We obey because we are saved by the blood of Christ. We are so thankful. “God, I love you so much I want to obey you and honor you with my life.” Just as my pastor said a few weeks ago “focus on loving God more.” Grace should lead us to obedience. Charles Spurgeon reminds us that if you supernaturally change a pig into a man while he is eating trash he will stop dead in his tracks. He will be ashamed. He will be disgusted. He is not a pig anymore. He can no longer devour the things that he used to devour. He is a new creature. In the same way those in Christ are not what they once were. They are new creatures. They will no longer live in sin. Believers have a new relationship with sin. Many people claim to be Christian, but their lives have never changed. Many people are just religious. Many don’t have a personal relationship with Jesus Christ. They just do Christian activities such as go to church, sing in the choir, etc. They don’t have new desires for Christ and His Word. Has your life changed? God’s greatest goal is to conform you into the image of His Son. Is God working in your life to conform you into the image of Christ? Are you growing in holiness? Evidence of your faith in Christ is that your life will change. You will bear good fruit. Are you unregenerate? Does sin affect you or not? Our generation appears to be blasé about the problem of sin. We do not consider its consequences seriously enough. You would be surprised at how many people I talk to who said they’re saved because a pastor prayed for them. Some of the things I hear are absolutely horrifying. We don’t understand the gospel and have watered it down to the point that many who think they are saved are not. Paul said, “how could those who have died to sin still live in it?” We hate correction. All we want to hear is grace, grace, grace, but Jesus preached on Hell more than any other issue in the Bible. God is holy, holy, holy. Understand that I am not preaching a works salvation. I’m talking about evidence of your faith in Christ. Is there evidence that the Holy Spirit is living in you and working in you? Do you think, “I am under grace”? or “I can live like the devil”? That is a lie from Hell. Have you ever heard someone say that Jesus is so forgiving that I can sin all I want? That type of thinking shows that they have an unregenerate heart. We have forgotten that the way to Heaven is narrow. Only a few will find it. Those who have been saved by Christ will not practice sin. There is no such thing as a Christian who lives in fornication, adultery, witchcraft, homosexuality, hatred, murder, worldliness, etc. This exhibits bad fruit and a false conversion. There is no fear of God in the unregenerate man because God’s Spirit is not in an unregenerate man. Leonard Ravenhill said, “you go to the cross, but you don’t get on the cross.” Have you gone on the cross? Are you dying to self? John MacArthur said, “a gospel that does not confront sin is not the gospel of Jesus Christ.” There are massive false conversions going on in Christianity and the reason is because we do not preach against sin anymore and we give a watered down cheap grace. If Jesus looked you in the eyes right now would He call you a hypocrite? Am I teaching that a Christian doesn’t struggle with sin? No! Not at all. We all struggle with sinful thoughts, desires, and habits. I struggle with sin. My only hope is in Jesus Christ. However, there is a difference between struggling with sin and practicing sin. As Christians we make war with sin and we cry out to the Lord for help. Unbelievers are dead in sin and they don’t care. Believers want to be more obedient. We are burdened by our struggles. We cling to the cross. It is even possible for a believer to backslide. However, if God allows that person to remain that way then that is strong evidence that the backslider was never a Christian to begin with. He was a poser that stopped posing. God will bring back His backslid child. God will discipline His child out of love. God will not allow His child to go astray. Are you struggling with full assurance of salvation? The more you get to know God intimately, the closer you approach the light. The more you understand how holy He is the more you will appreciate how sinful you are. I used to struggle with having full assurance of salvation. Some days I would be so confident of my salvation. Then some days I would be so depressed. I was living in idolatry because my joy was coming from my performance. Don’t allow your joy to come from your performance on your walk of faith. Allow your joy to come from the perfect merit of Jesus Christ alone. I prayed for full assurance of my salvation and after weeks of wrestling with God He finally gave me full assurance. I am confident that when I die I will go to Heaven because Jesus died for me. Do not attempt to find hope in yourself. The more you get to know God and become aware of your sin the more you should rejoice. God pours out His grace in abundance. You know you can’t save yourself. Jesus is all you have. It’s either Him or nothing. God allowed me to realize that. God loves me and nothing that Satan says will ever change that. In the paragraphs above I talk about sin a lot because there are many professing believers who are living in rebellion and sin. I don’t want to see anyone separated from God. I am compelled to preach repentance. However, there many people who are truly Christian, but are struggling with the full assurance of salvation. I don’t want you to fall into a false condemnation. A sense of guilt for the smallest things. No. We will never be truly free from sin until Jesus returns. Don’t live like that. Don’t doubt the great love that God has for you. He gave up His Son for you. God loves you so much. God knew you were going to be messy. You can’t surprise Him when you fail and make mistakes. He already knows. As Solomon says of his bride, “one look of your eyes and My heart beats faster for you.” He dances over you. You will rely upon Christ alone. You will love God more. You will have a greater sense of your sinfulness and your deep need for a Savior. You will confess your sins daily and grow in repentance. You will seek to be obedient to the Word of God. 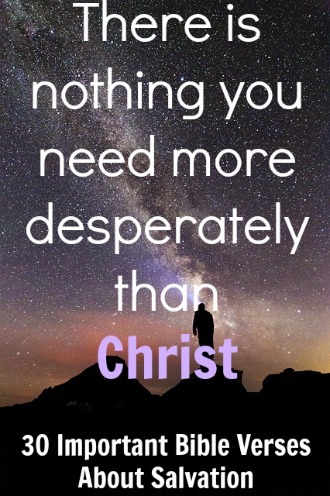 You will have new desires and affections for Christ. You will grow in your knowledge of the gospel and dependence upon Christ. You will separate from the ways of the world. You will desire to have fellowship with Christ and with other believers. You will grow and produce fruit, sometimes faster than others and sometimes way slower than others, but there will be growth. God will work in your life to conform you into the image of Christ. Water baptism – Baptism is an act of obedience. It is important, but it is a public declaration of your faith in Christ. It is a symbol of dying with Christ and being resurrected with Christ unto newness of life. After we are saved we should get baptized, but baptism does not save. You won’t lose your salvation if you don’t get baptized, but a believer should desire to be baptized after putting their faith in Christ. Going to church – Going to church doesn’t make you Christian any more than standing in a garage makes you a car. I believe many people walk into church and they don’t think about God once. Idolatry abounds on Sundays. Many are worshiping a god in their imagination that lets them live like the devil. I had a guy once tell me that God is OK with him being a homosexual. No! The god you made up is OK with it. Even though going to church doesn’t save you, we should not forsake church. It is essential for your walk of faith that you regularly attend a biblical church. Obeying God – Obedience is evidence of repentance, but it does not save you. Works do not save us. We can’t maintain our salvation by our obedience. God desires perfection. We must trust in the perfect obedience of Christ on our behalf. How can we neglect so great a salvation? This past week God has been leading me to preach the gospel to myself. He’s been telling me “how can you neglect this great salvation?” I wake up and I don’t think about the blood. I wake up and I don’t thank Him for His grace. I don’t thank Him for making me new. I don’t thank Him that I’m able to seek Him and get to know Him. When is the last time that you prayed, not to ask for anything, but just to be with Him? Has your love for Christ become so common and dull? Repent. What an amazing salvation. Please cherish it and cherish Him. Change your prayer life. Get alone with God until you know Him intimately or until you die. Love Jesus until your very last breath. Jesus is the only way to Heaven!